Widespread use of the injection process is impractical and expensive. But it could potentially help save trees of historic or sentimental value. Garlic is one of nature’s most powerful antibacterial and antifungal agents. It contains a compound called allicin, which scientists are interested in harnessing. The experimental injection device is made up of a pressurised chamber and eight “octopus” tubes. The pressure punches the solution through the tubes and through special injection units in to the tree’s sap system. The needles are positioned in a way to get allicin evenly around the tree. The moment the active agent starts to encounter the disease, it destroys it. The poison is organic and isn’t rejected by the tree. It is pulled up the trunk out along the branches and in to the leaves by the process of transpiration – the flow of water through a plant. 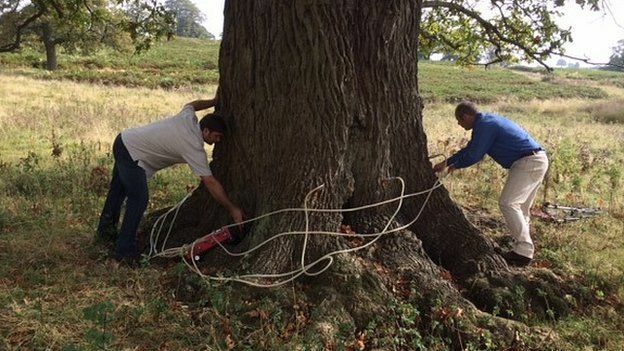 “Over the last four years we have treated 60 trees suffering badly with bleeding canker of horse chestnut. All of the trees were cured.